3 World Trade Center will be opening in early June, with lead tenants including music streaming firm Spotify and advertising giant GroupM. Today, the World Trade Center's commercial vacancy rate is below 10 percent, thanks to the infusion of tech, media and advertising firms like Omnicom Media. The Trade Center will also soon have its own world-class performing arts center. Construction workers work on the roof of Three World Trade Center high over Manhattan and Brooklyn on April 5, 2017, in New York City. It's finally happening. More than 16 years after the World Trade Center tragedy, a major component of the rebuilt WTC site is getting ready to open. 3 World Trade Center will be opening in early June, with lead tenants including music streaming firm Spotify and advertising giant GroupM. It will join 1 and 4 World Trade Center, the other two major buildings on the site, along with 7 World Trade Center on Greenwich Street. The completion of this phase of the World Trade Center comes as the Financial District of New York is experiencing a renaissance. I was at the World Trade Center during the Sept. 11 tragedy and worked at the NYSE in the immediate years after. The Financial District was filled with vacancies and remained relatively sparsely populated in those years. And then, it began to change. "It's a very different neighborhood than it was in 2001— it's very different than it was even five years ago," Jessica Lappin, president of Alliance for Downtown New York, told me. "We still have financial firms, but what's been amazing is to see tech, media, advertising firms — companies like Spotify and Group M — move down here as well and really change the face of the workforce and the feel of the neighborhood." Today, the commercial vacancy rate is below 10 percent, thanks to the infusion of those tech, media and advertising firms like Omnicom Media. And many people now call it home: 61,000 people live in the Financial District, more than ever before, most of them young professionals. And there are tourists galore, so many you can barely walk down some streets. Nearly 14 million came downtown in 2017 to visit Wall Street and the 9/11 Memorial, an 8 percent increase from 2016. The hotel business is booming as well: there are 7,000 hotel rooms in 32 hotels downtown, with another 2,000 under construction. The World Trade Center Transportation Hub, known as the "Oculus," was completed two years ago and serves 250,000 commuters a day. The formerly rundown Seaport District is bustling with new shops and businesses, including new restaurants by Jean-Georges Vongerichten and David Chang. Live Nation is opening a 3,400-person rooftop entertainment complex in August that will kick off with performances by Amy Schumer. Sports television giant ESPN also unveiled its new production studios on Pier 17. Plus, construction on the Ronald O. Perlman Performing Arts Center began last year, and it is expected to open in 2020. As for the Trade Center, it's taken awhile, but the nearly 8 million square feet of space at the three main buildings is slowly being filled. 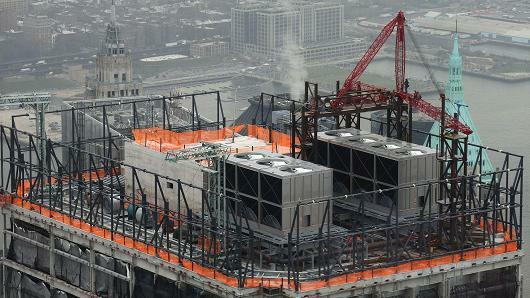 1 World Trade Center is now nearly 80 percent leased. Even the newly opening 3 World Trade center is nearly 40 percent leased, and 4 World Trade Center is 100 percent leased. With so much going on, downtown leaders are trying to improve traffic flows around the New York Stock Exchange, a major business, tourist and business destination. They've also proposed moving the now-iconic Wall Street bull, as well as the Fearless Girl, from their present location in lower Broadway to right in front of the NYSE. 0 Response to "The World Trade Center is finally nearing completion"